Poppy colors tend to attract a lot of attention, so it’s a good recipe for any case to follow. Well, that’s essentially what the folks over at Spigen kept in mind with one of its latest cases for the iPhone 5. Flaunting a fresh trifecta of colors, the Spigen Linear Pops case for the iPhone 5 is bound to gain some quick looks from anyone that glances at it – thanks mostly to its poppy color scheme. 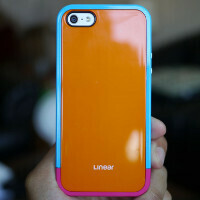 Out of everything, the biggest draw factor of the Linea Pops case is the flashy paint job it’s sporting. Simply, it’s a marvelous contrasting thing with its orange, blue, and pink combination – colors that no doubt stand out on their own, but when combined together, they really stir up some attention. Aside from the mesmerizing paint job, it’s nice to find that it’s also form fitting and doesn’t add a whole lot of bulk to the handset’s sleek profile. At the same time, the polycarbonate frame helps to give it a reasonable amount of protection – albeit, we wouldn’t necessarily say it’ll handle extensive drops that great. Comprised out of three components, a small interchangeable bottom piece, the main outer frame, and a sturdy rear casing, they all come together to give the case its confining feel. However, it’s a little bit of a pain trying to remove it, seeing that we have to finagle with one of the joints where the two outer frames come together, just to take it apart. Now, you might think that the front of the phone might be left exposed, but Spigen is nice enough to include one of its screen protectors with the purchase. At $28 a pop, the case is well within the same boundaries as some other comparable ones out there. It’s not the most sufficiently protective case for the smartphone that we’ve seen, but then again, some will appreciate its minimal bulk and colorful appearance.